This hunt is done during the rut in mid September so bulls can be called in close, we also take advantage of springs and wallows. The archery moose hunt takes place at the beginning of the moose rut when bulls are starting to let their presence be known by raking bushes and maintaining rut pits. This a great time to call them in with raking some bush pretending to be a bull intruding there area. The archery hunt is a great time for a P&Y bull moose. This is a high success moose hunt that is run out of our main lodge Sept. 24-Oct. 15 during the peak of rut, so bull moose cooperate well with our calling. This hunt also takes place in a high density of moose where bulls will average 40 inches wide. Once the full rut starts rifle season opens up and bulls are on the move finding cows we get great rutting action with aggressive bulls calling and raking trees. We do also offer spike camp options for guys wanting to try more remote areas and would like to rough it. The November moose hunt takes place after the main moose rut hunt when bulls are starting to group up and feed hard before winter is in full force. This hunt has been just as successful as the rut hunt but we use a different hunting style, we drive trucks and atvs to locate tracks in light snow then go on foot or set up in travel route. Bulls can also be caught feeding in cut blocks at this time. 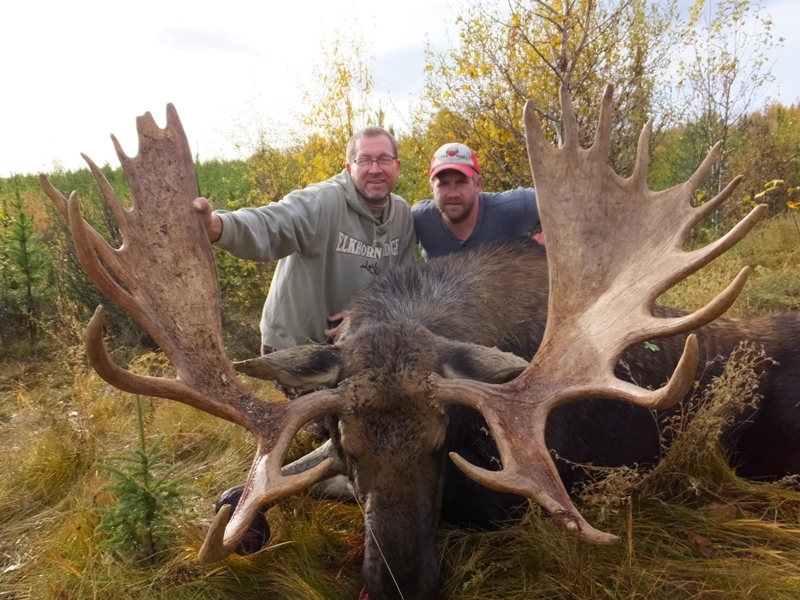 We offer these trophy moose hunts during archery moose season, rut moose season. These hunts take place in the absolute premium units in the province of Alberta. This hunt takes place in the foothills on the edge of the mountains and many provincial parks. A very limited number of tags are issued in these areas the few we have are guaranteed licenses. This is a mountain hunt, it is not for everyone!!! For this moose hunt we travel to the hardest spots to access in our area, some are up to 2 hours from our main lodge. We use a variety of camps which include trappers cabins, outfitter tents, campers and a portable refer van. These areas hold bigger moose on average due to their remoteness or hard accesses for resident hunters. Our goal is for moose 50 inches and up. This is a harder hunt for experienced hunters with a 95% success rate.